By ironanglerx2, January 27, 2014 in Questions About Trout & Salmon Trolling? Hello, just wondering about how to ask these questions,new to this fishery, heard allot of great stories,what kind of lure selection would you start with for brown trout in spring? Also wanted to know if i launched out of the little salmon where is a good stating point,and do i look for the warmest water i can find? PLEASE HELP THANK YOU! Aj Thundersticks,,, spoons,Rapalas, Rebels,Smithwicks, All floaters. Soon as you get out in the lake, Head west close to shore, 8-15 ft deep water, Look for dirty water out in front of the creeks... You will know if the fish are there,,, Dead give away,, Battle of the boats, Combat fishing,,,, I love it! I try to maintain my speed around 2.0 SOG. Planer boards will help you run more lines and spread everything out. Yeah what BAZOOKAJOE said. the spring shorline brown trout fishin is always better when there is a mudline along shore. Same thing with the colored plumes coming out of the creeks. The dark water will be a couple degrees warmer than the clear water. I've had my boat in as shallow as 5 feet of water and my inside board practically skipping off of shoreline rocks in 2 fow and caught browns in there. If there is a heavy mudline, most times, you want to fish just inside the edge of it rather than deep in the soup. On the muddy side, noisy baits like Smithwick rattling rogues really shine, whereas more subtle baits like thundersticks, rapalas (both strait and jointed) etc are better on the clearer side of the boat. A few of the must have lures on my boat are siver/black, gold/black and log perch smithwicks (I believe that smithwick changed the name of the log perch to something else now, but they still make the pattern) the log perch IMO is an almost perfiect goby imitation. J7 and J9 jointed rapalas in gold/orange and silver/black, F9 and F11 Rapalas in silver/black, silver/chartreuse and a variety of thundersticks. 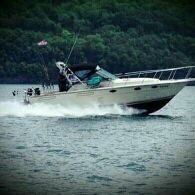 I also like to run a light flutterspoon way back on a rigger behind the boat. One of my favorites is a chrome/green/chart jr flutterdevle 3-4' down and 70-80 back on a rigger. Depending on where you are fishing, you'll also find coho's in there as well and they are very aggressive and not the slightest bit boat shy. i usually have one of my riggers running a bright orange bait right in the prop wash, down 2 feet and maybe 12-15 feet back. The coho will come right into the wash and smash those baits. If you are launching at the Little Salmon I wouldn't run the boat to Oswego. You should be able to find fish much closer than that. If you are thinking of fishing by the plant, don't get too close or you will get visited by USCG. If you want to fish Oswego, just launch there. just went to smithwicks website and the lure tim was talking about looks like a rattln rouge tiger minnow,ill be ordering some tom.!!! Yeah, that's it, I knew they changed the name but couldn't remember the new name. Shame thay don't make it in the 3 1/2" anymore. tim,do you think 4.5" are to big for browns? Another fairly newbie to the big lake I've been out about a half dozen times from N.H.in last 15 yrs and has been about six yrs since last trip.Can't wait for April just got new boat and more time so really like this site and the info !! A special thanks to the poster and Tim Bromund with a wealth of info. No, they catch plenty of fish too, I've just had better luck overall with the 3.5" one. All the other Smithwicks I run are the bigger 4.5", but for whatever reason the 3.5" in that color smokes em. I only have 2 or 3 of them left. Another killer for big browns is a jointed thunderstick,, Red hot firetiger, We cant keep the big fish off them. Don't forget the Mich Stingers for great brown fishing. All i use and with great sucess might add.